BHPSC tells Sainsbury’s: Apply your ethical trading policy to illegal settlement business! On Saturday July 5th members of BHPSC demonstrated outside the Sainsbury’s Local in St James’s Street. We were leafleting as part of the national Boycott Sainsbury’s campaign, supported by the Palestine Solidarity Campaign, aimed at raising awareness about illegal Israeli settlements in the occupied Palestinian territory, and the terrible damage done to the Palestinian farming economy by those settlements. 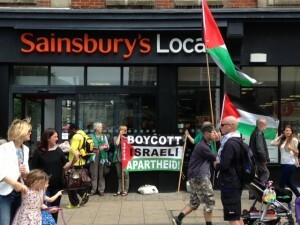 The campaign calls on Sainsbury’s to apply its exemplary ethical trading policies to the unethical practice of trading with illegal settlements, and to follow the Co-operative’s good example by stopping its trade with suppliers that profit from Israeli settlements. We hope that, at next week’s Sainsbury’s AGM, shareholders will recognise that there is a deeply troubling contradiction between the company’s ethical trading policies and its continued trade with illegal Israeli settlements, and will vote to end this practice.